Emerson Electric (NYSE:EMR) CEO David Farr has done a pretty good job of preparing investors for a tough year ahead for the company. You know you're in trouble when an earnings presentation begins with the words, "It is a global industrial recession." That said, investing isn't just about buying companies that are currently flying high, and Farr's guidance was enough to reassure investors, who took the stock higher in a down market. Let's take a look at Emerson Electric's first quarter and what management said about it. The results make grim reading. Sales declined 16%, with underlying sales down 9%. Earnings before interest and taxes (EBIT) margins also declined to 11.7% from 14.5% in last year's first quarter. Ultimately, EBIT fell 32% to $549 million and adjusted EPS fell 25% to $0.56. On the plus side, the numbers were actually a bit better than management's guidance for the quarter has predicted. In the company's fourth-quarter earnings report in November, Farr forecast a decline of 10% in underlying sales, and management's expectations were for adjusted EPS of $0.50. It's useful to break out Emerson's segmental detail in order to see the underlying trends in its business. Emerson is largely reliant on capital spending programs in the industrial and energy sectors -- in other words, exactly the sort of things that get hit first in a downturn. A breakout of its 2015 earnings shows the relative importance of each segment. 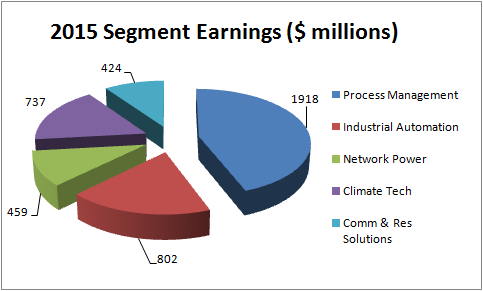 Data source: Emerson Electric presentations. 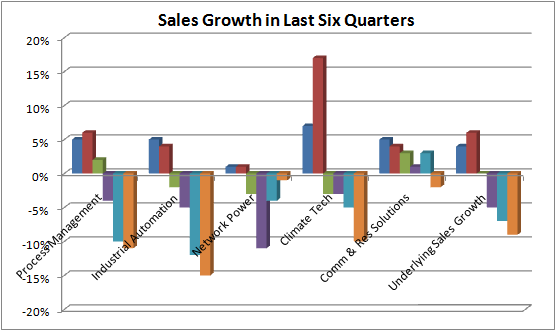 And a graph of sales growth by segment demonstrates how its most important segments -- process management and industrial automation -- are also the weakest at present. Emerson's process management business has significant exposure to the oil and gas industry, so it's no surprise to see weakness there, although management did point out that conditions in its power, chemical, and life science markets were expected to remain favorable. Performance in industrial automation continues to be weak, with trailing three-month orders down 15% to 20% each month from October to December. Moreover, industrial automation rival Rockwell Automation (NYSE:ROK) disappointed investors recently by lowering its full-year guidance -- a sign that trends worsened in the last quarter. When lowering guidance for the full year, Rockwell CEO Keith Nosbusch said, "Since providing guidance in November, oil and commodity prices have further deteriorated, and projections for economic growth including industrial production have softened." However, Rockwell and Emerson Electric may be taking an overly pessimistic worldview. For example, another rival, Europe-based ABB Ltd. (NYSE:ABB), cited order growth of 7% in Europe when it reported results on Wednesday, and talked of "modest growth in Europe" in its outlook. In fact, ABB's local comparable orders and revenue only declined 2% and 1%, respectively. Despite Emerson Electric's talk of a "global industrial recession," it's not quite all doom and gloom out there. Orders are anticipated to turn positive in April. Sales are anticipated to turn positive in the third quarter. More restructuring will take place if markets weaken. Full-year guidance that underlying sales will fall by between 2% and 5% was maintained. Full-year adjusted EPS guidance range of $3.05 to $3.25 was maintained. Full-year free cash flow anticipated at around $3 billion. Essentially, Farr maintained the guidance given in the fourth-quarter earnings, but investors should look to the upcoming investor conference on Feb. 10 for more detail. Clearly, if the guidance targets are hit, then a snapshot of Emerson Electric will reveal a company with positive sales growth and strong cash flow in the second half -- in other words, a much healthier investment proposition than it is now. Emerson Electric's exposure to energy markets has meant Farr has been fighting to counter weakening end markets for almost two years now. As such, the company is probably earlier along the path of restructuring to compensate for end-market weakness than, say, Rockwell Automation is. That's good news -- it suggests that Emerson may well have an easier time hitting its guidance, and its ability to do that is what investors will judge the stock by in 2016.